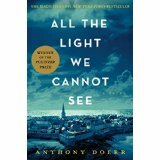 I wasn’t thrilled when our book group chose All The Light We Cannot See by Anthony Duerr. I’d heard a lot of good things about the book, plus it was suggested by someone whose opinion I particularly admire, so I didn’t object, but I have to admit my first thought was Oh, no. Not another book about World War II and German brutality. I was wrong. This book is different from most that I’ve read. I was immediately drawn in by the writing itself: sumptuous descriptions, inclusion of details that added texture and layers of meaning to the settings and the people who inhabited them. Even more important was the theme of the story: the humanity of individuals trapped and transformed by the inhumanity of war. The story unfolds in short chapters – so short, in fact, that they seem more like bursts of memory than episodes in a novel. There are multiple points of view (one of my favorite story-telling devices). The two main characters are a French girl, Marie-Laure LeBlanc, six years old and newly blind when the story begins, and a German boy, Werner Pfennig, age eight, living in an orphanage in a coal-mining town, obviously intelligent, but without much promise of a future when we first meet him. Doerr juxtaposes the girl’s lack of sight and the resulting heightening of her other senses with the boy’s fascination with invisible radio waves to evoke the unseen life teeming around us – to make us aware of possibilities waiting to be explored. I won’t go into plot points because the book isn’t about events, but rather about the inner workings of the human spirit. We witness the step-by-step progression from innocence to evil as we are shown the training methods of an elite school for German youth, but, even here, no one is totally evil. Even the least admirable character is given small moments in which we sense what he might have been had it not been for the horror of war. Some characters risk their lives to help destroy the invading force, but they can’t accomplish much on their own. In order to prevail, good needs good. To me, the most tragic figure in the book was Frederick, a sensitive boy who became part of the Hitler Youth – not to further his own interests, but because his patriotic German parents desired it. Without actively rebelling, he resists efforts to break and dehumanize him and is ultimately destroyed. Having said that, I have to wonder if his actions were really in vain. At least one other boy recognized his heroism and was moved by it. Were there others whose thoughts we did not see who were similarly affected? One of the points that came up in our group’s discussion was whether or not Werner was an albino. Doerr makes it a point to repeatedly state how blond (actually white) the boy’s hair is, how pale his eyes. My own feeling is that he was not an albino, but that the author used his physical appearance to portray the ultimate example of the blond Aryan favored by Hitler. This, coupled with Werner’s performance when he is chosen to attend an elite school, shows him as the seemingly ideal Hitler Youth. The genius of the book lies in the fact that the reader understands the sensitivity and humanity that lie beneath that façade. Volkheimer, a brutal killer who loves music, says of Werner: “What you could be.” I closed the book thinking the same could be said of any character within its pages. Very interesting and intense. I will have to hunt for this book. Thank you for the review. Thank YOU, Leigh, for stopping by. I do recommend this book (obviously). In addition to the things I mentioned, there are other elements that (a huge diamond and the repeated mentioning of Jules Verne’s Twenty Thousand Leagues Under the Sea) that add layers of meaning to the story. LOL I know what you mean about time for reading, Karen. All The Light We Cannot See isn’t about battles and tanks, etc. It’s a very human book. Thanks for taking time to comment. Thanks to your insightful critique, it sounds as if this story does an excellent job of mixing the light with the dark. I need to add this book to my TBR list. Mixing dark with light – what a perfect way to put it. Thanks, Sydell.